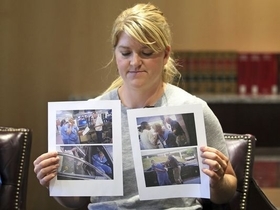 In this Friday, Sept. 1, 2017, file photo, nurse Alex Wubbels displays video frame grabs from Salt Lake City Police Department body cams of herself being taken into custody, during an interview in Salt Lake City. A Utah nurse who was arrested for refusing to let a police officer draw blood from an unconscious patient settled Tuesday with Salt Lake City and the university that runs the hospital for $500,000. In this July 26, 2017, frame grab from video taken from a police body camera and provided by attorney Karra Porter, nurse Alex Wubbels is arrested by a Salt Lake City police officer at University Hospital in Salt Lake City.